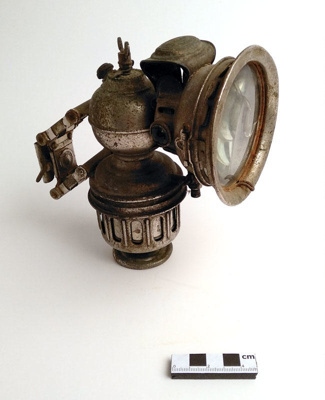 A Phoenomen (Reimann- German inventor) bicycle, motor bike lamp, a silver carbide lamp with attachment to fit to bicycle. Base unscrews. Red and green faceted glass jewels each side of lens. Early 1900's with adjusting knobs.